If you own a 2 or 3 story home or hotel with several floors stair tread lights or stair case lights can prove to provide convenience and safety to your home or hotel. It can also add a touch of sophistication to your home or hotel as well. Step lighting comes in many different types and styles and can be designed for the front of each step, the side of each step or higher in the wall above the step to cast light down on the steps. Stair case lights are normally low wattage with some lights only being 1 watt per light and provides a gentle glow that is incredibly appealing. Each Type of step lightening has its own benefits. Here is a look at some of the features and benefits of each type of step lightening. Stair Tread Lighting- Stair tread lighting generally refers to lights on the front of your step. This type of lighting increases the safety of going up and down stairs in the dark since the light sit in the front of each step and lights the step below. This type of stair case lighting adds a warm glow to your staircase. Side of Stair Lighting- Stair tread lights that light the side of each step is normally just referred to as stair case lights or step lighting. These type of lights may direct light down, up or both and lights each individual step on which the light sits. These types of lights provides safety by lighting the each step and creates a nice ambiance especially on open stair cases. Wall Mounted Step Lights- Wall mounted step lights are mounted higher on the wall and shine down on the steps. These types of lights work well for steps that are open in both the front and the sides where the steps don’t sit directly against the wall. That way you still have light to provide safety for going up and down stairs in the middle of the night. Here at Ultra Beam Lighting we provide a variety of different LED stair tread and stair case lights to meet your needs. We have stair case lighting that radiates down, up, both up and down and from side to side. These lights come in round, square and rectangle shape. Our LED stair tread lights are our own original design and come with a 3 year guarantee. We use the latest technology in making our lights and our stair case lighting is perfect for both home and hotel use. 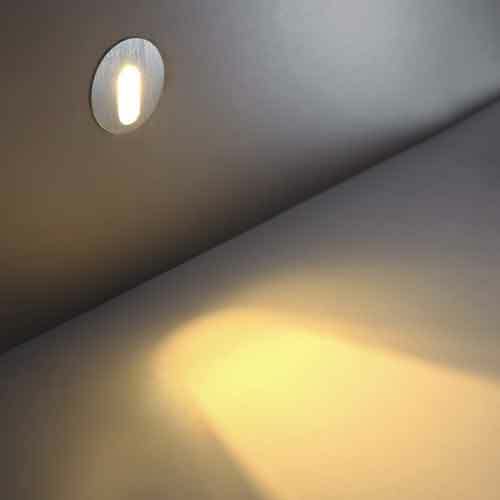 Our LED lighting provides 20,000 of light and last 20 times as long as standard light bulbs. We have lights that are perfect for the front and side of your stairs as well as lights that can be used higher up on the wall over your staircase. Why not browse through our website and see what different types of stair tread lights will work the best for you staircase. When installing this type of lighting make sure you hire a licensed professional electrician to install the lighting.